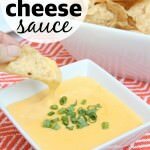 A fast and delicious homemade nacho cheese sauce made with real cheddar cheese! I have to admit that my family loves the gross jar of nacho cheese goo that you can buy in the chip aisle. It’s gross. I know it, but we still eat it. I love making this cheese sauce for nachos instead because it uses real food. No cheese product in this sauce. No sirree. And it tastes better than the jar of orange goo. On top of that, this sauce is also so easy to make. Some cheese grating and whisking and 15 minutes later you have yourself a smooth and creamy cheese sauce. Because this recipe uses real cheese as opposed to cheese product it does start to get firm when it cools. Make sure you use it immediately or keep it warm until you use it. I have thrown this in a slow cooker after making it and put it on the warm setting with great results. You’ll just have to give the cheese a good stir before serving. Melt the butter in a skillet over medium heat. Add the flour and briskly whisk until combined. Add the milk and continue whisking until all the lumps are gone. Increase the heat to high and bring the milk mixture to a boil. Season with salt and cayenne pepper, stir to combine. Remove from heat and add the shredded cheese. Continue to whisk until the cheese is completely melted and the mixture and smooth. To reheat: Add cheese to a saucepan over medium heat. Add 1 tablespoon of milk and heat and stir until smooth. DO NOT reheat in the microwave as it will turn grainy and will not yield a creamy cheese sauce. I make everything in my enameled cast iron dutch oven. We are celebrating National Nachos day today with our blogger friends. We think this nacho cheese sauce would be the perfect thing to make today to celebrate! Then invite all your friends over for a build your own nacho bar! Don’t forget to like us on Facebook, follow our YouTube Channel, and watch our day to day happenings on Pinterest and Instagram! Posts may contain affiliate links. If you purchase a product through an affiliate link your cost will be the same, but My Mommy Style will receive a small commission. Your support is greatly appreciated! Welcome! I am Camille, a wife, mother of four, Disney obsessed, certified teacher, and reality optimist. Motherhood comes with its ups and downs, and I hope while you're here you'll find something that makes your #momlife easier!